Waterloo – Wilfrid Laurier University’s Schlegel Centre for Entrepreneurship & Social Innovation will present a public lecture Nov. 15 entitled ‘Strategic brand building through entertainment’ as part of Global Entrepreneurship Week. 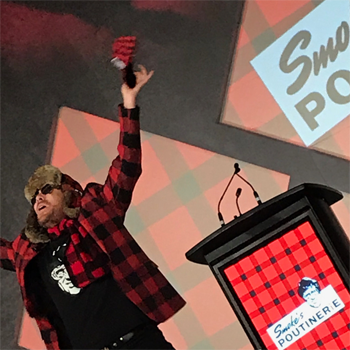 The keynote will be delivered by Ryan Smolkin, founder and chief entertainment officer of Smoke’s Poutinerie, the world’s largest and original poutinerie with more than 150 locations in Canada and more than 50 open and in development in the United States and other international markets. During his presentation, he’ll announce a once-in-a-lifetime opportunity for Laurier students attending the session, to remain a surprise until Thursday. "I continue to have the opportunity to guest-speak on platforms around the world, but I don’t get a lot of time for the students. My time as a student at Wilfrid Laurier University was epic and I wanted to bring this unique edutainment partnership back to the Laurier business superstars,” said Smolkin. “I am totally stoked to rock out and bring my experience, insight, and entrepreneurial spirit to those who want to take a ride on the Smoke’s Poutinerie Rock ‘n’ Roll Gravy Train. Fire it up!" While he was a student in the Lazaridis Bachelor of Business Administration program, Smolkin established several successful business ventures, including a portfolio of rental property investments, which he built to more than $4 million in assets before selling in 2004. Smolkin launched his next business – an internationally recognized brand and graphic design firm with clients such as Maple Leaf Sports & Entertainment, Nike and Molson. He then combined his love of entertainment with his love for poutine and launched Smoke’s Poutinerie. Smolkin will talk about the journey into franchising as well as the challenges he has faced as a serial entrepreneur. Smolkin will speak about how he is working toward his goal of opening 1,300 restaurants over the next five years. The Entrepreneur Speaker Series is part of the activities hosted by the Schlegel Centre in partnership with student clubs for Global Entrepreneurship Week. The speaker series will be held Thursday, Nov. 15 from 5:30 to 7 p.m. in the Lazaridis Hall Atrium, located at 64 University Ave. W, Waterloo, Ont. The event is free and open to all students, staff, faculty, and alumni. Please register at: poutine2018.eventbrite.ca. The Schlegel Centre serves all students across the university’s campuses with entrepreneurship programming including its flagship incubator, LaunchPad. A centre within the Lazaridis School of Business & Economics at Wilfrid Laurier University, the Schlegel Centre was the first university centre for entrepreneurship in Canada.